Traditionally tax saving is all about LIC and insurance, but there are ways you can save tax without insurance, and earn good returns. Here are some tax-saving options that are not insurance based. I am being asked by friends and those who are regulars at stepupmoney “What are good tax-saving options this year?” And before I can answer, out comes the other quote “I have asked my LIC agent to tell about a policy, but are there any other options?” I simply ask them, how many LIC or for that matter insurance policy will they take, and why insurance always, when there are less expensive – more returns oriented tax savings options available. 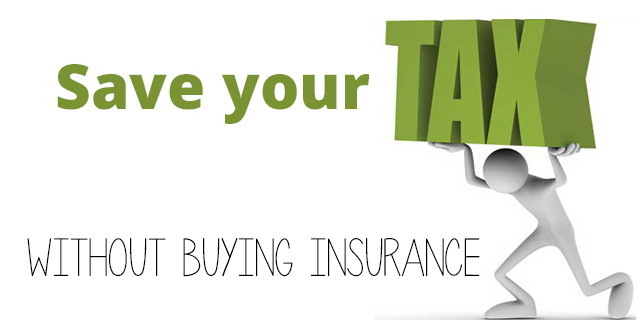 Look beyond Insurances for your tax saving needs. You buy one good Term Life insurance policy, one good health insurance policy and that is enough for yourself. The premiums you pay on them year after year are deducted from your taxable income. If you fall short of the available tax-free investments limit, then don’t keep buying additional or wrong insurance products just to save tax. This way you are not saving taxes, you are just wasting money and forgoing better returns and living in a bubble that Insurance is the best way to save taxes. Look beyond that, there are a lot of options to save taxes that are not insurances. This the best tax saving investment that you should be investing in all year round. It is the only product that is entirely exempt from tax. The amount you invest in a PPF account is deducted from your taxable income, the interest you earn is tax-free, and the maturity amount is also tax free. You earn 8.7% compounding interest and it is also a great way to plan for your retirement. Read here for more details. We love Fixed Deposits and if Fixed Deposits can save taxes, it’s just the icing on the cake. There are tax saving Fixed Deposits offered by banks, and they come with a lock-in period of 5 years. The amount invested in the FD is exempt from taxes up to a limit of Rs. 1 Lac. However the interest earned is taxable. You can find additional details here. Equity Linked Savings Scheme or ELSS in short, is offered by Mutual Fund houses and is a great long term option for saving taxes. Since it is a Mutual Fund, you can invest in it through SIP (which is highly recommended) or you can put in a lump sum as one time investment too. There is a lock in period of usually 3 years before which you cannot withdraw your money. However, being an equity scheme, you will be better off opting for SIP route and investing for at least 5-7 years. The amount invested in the scheme is exempt from taxation up to the limit of Rs. 1 Lac. The returns earned are also tax-free. National Savings Certificate is a product offered by the Post Office of India and comes in 5 years and 10 years lock-in periods. You can choose any one depending on your preference. Again the amount invested in this scheme is exempt from tax up to a limit of Rs. 1 Lac. Even though your total invested amount can be more than 1 Lac, for tax saving purposes the limit that will be considered is Rs. 1 Lac. The returns earned are @ 8.5% for 5 year scheme and 8.8% for the 10 year scheme. No TDS is applicable on the returns but the returns are NOT tax free. Similar to the NSC, you can invest in Post Office Time Deposit Schemes to avail of tax benefits under section 80C. Your investment under this scheme will carry a lock-in period of 5 years. You are eligible for tax exemption on the invested amount up to a limit of Rs. 1 Lac even though you can invest a higher amount in the scheme. The returns earned are taxable. These are some of the options that not all of us, consider or at times are not fully aware of. These are simple options and pretty straightforward to follow. They give you tax-savings and also good returns. Among the five; PPF, ELSS, and Tax Free FDs should be on top of your list. There are tax free investment options beyond LIC and Insurance too and we just saw 5 good ones. Invest now, earn returns, and save taxes. Happy tax-saving investments!